It’s pretty important to add metadata info to your original videos or downloaded videos, which will help better understand the videos. 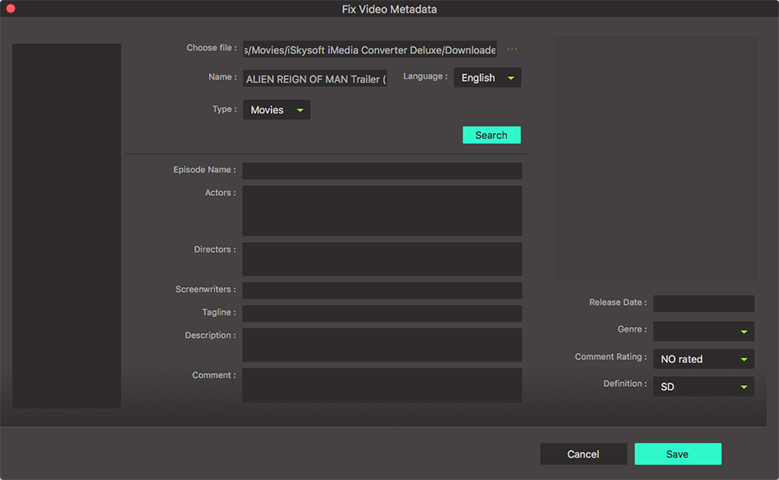 Now you can read this page to learn how to add metadata to a video or fix metadata info for the downloaded video. Open iSkysoft Video Converter Ultimate on your Mac. Click the "Toolbox" tab from the top menu. Then select "Fix Video Metadata". From the pop-up window, you can change the name, type, description, episode and more. By the way, there is a “Search” button on the menu; you can search for the metadata info of your video online. After making all settings, please click on the “Save” button to save your video metadata.